Here is a clever idea lets replace that old dusty optical disc drive with a pico projector. Who uses a dvd drive in a netbook nowadays anyway? I mean look at the macbook air, they seem to be fine without it. 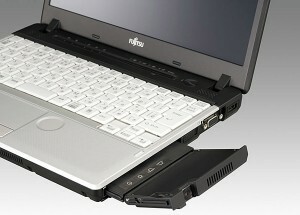 That is what Siemens is doing in their Fujitsu laptops nowadays, and it seems pretty nice. Fujitsu has just rolled out its latest line of portables and a pair of them pack a pretty awesome new extra: an integrated pico projector. The 13.3-inch LifeBook S761/C and 12.1-inch P771/C both fill their ODD slots with a small visualizer, and while the specs of its actual output aren’t clear, the two machines have been fully specced and priced. The S761/C can offer you a Core i5-2520M CPU, a (presumably upgradeable) 1GB of RAM, 160GB of storage, and a 1366 x 768 resolution for a price of ¥219,450 ($2,675). Moving down in size class but up in price, the P771/C matches those specs, but for a squarer 1280 x 800 resolution, and asks for ¥255,150 ($3,110). Both will be available in Japan in mid-May, which is also when Fujitsu will release its LifeBook E741/C, whose claim to fame is the ability to authenticate users by reading the veins in their palms.